The Star Force version of Deadly Dressing Table. Found at the end of Kerning Tower's fifth floor Cosmetics Shops, in a map that requires 80 Star Force. A large beetle flying around with a black slime clinging on for dear life. Due to this extra weight, it can only hover above the ground instead of flying freely. Located in Singapore's Ulu City. It attacks by having the beetle push the black slime into you, causing your character to have black ink in the face. A monster from Temple of Time, found at Road to Oblivion 2. It casts a magic attack by concentrating magic into a sphere and releasing it. It can also cast a ice-based spell, which is unavoidable. The helpers also attack by scratching you. The Star Force version of Harried Hair Roller. Found at the end of Kerning Tower's sixth floor hair salon, in a map that requires 80 Star Force. The Star Force version of Oblivion Monk Trainee. Found at Detour to Oblivion 2 in Temple of Time, a map which requires 90 Star Force to deal full damage. A mutated Red Snail found in Henesys Ruins. It can slow you and attack you with its whip. A stone spirit monster found inside the Stone Colossus. It attacks by stomping the ground. A ghost that manifested out of a lantern. Attacks by breathing fire at you and smacking you with its tongue. Found at Vanished Village near Mushroom Shrine. A Kappa that has 2 attacks; one of them involves launching something with its cucumber, while the other attack is an energy beam shot from its mouth, which is short range and unavoidable. Found at the Creepy Bridge near Mushroom Shrine. A red Boogie-like monster that spawns at the Deserted House of Mushroom Shrine. It can power itself up and stun. A blue Boogie-like monster that spawns at the Vanished Village of Mushroom Shrine. It can power itself up and stun. A green Boogie-like monster that spawns at the Creepy Bridge Mushroom Shrine. It can power itself up and stun. A black Boogie-like monster that spawns at the Hunting Lodge of Mushroom Shrine. It can power itself up and stun. When it spawns, it's only visible as a tiny patch of grass. Located in Singapore's Ulu City. It stays in the ground when not aggroed so don't be surprised if you bump into this creature. When aggro'd, it will come out of the ground as a big worm creature face-to-face and do a screech attack at you before going back into the ground to chase you. An assassin found in the Sospetto Forest of Commerci Republic. Attacks with its whip. A stronger version of Nightwhip Assassin, found in the barrier deep within the Sospetto Forest of Commerci Republic. Summoned by Nightpriest Assassin. Attacks by breathing gas at you. A stronger version of Devileye, summoned by Nightpriest Assassin in the barrier deep within the Sospetto Forest of Commerci Republic. A mutated Tino found in Dark Ereve. It can raise the weapon attack of all enemies nearby, and stomp the ground. A dreaded monster wandering around the Hunting Lodge near Mushroom Shrine. She either casts magic on you by coiling her arms at you or attacks you fiercely with a horrifying look. A car monster that has been in the abandoned Ulu City so long that tree roots have filled its interior and taken over. It can run around by dragging the truck with the forward "limbs." It does possess attacks that can stun the player. 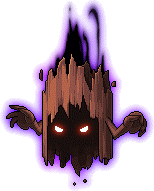 It attacks at close range, by digging its roots on the ground and creates a spiky brown cage around you that glows when closed on the player, which stuns the player. It also casts a debuff that can also stun you with a fairly long range. Be careful as this monster can stun lock you if you don't kill it quickly as it can spam the debuff + spiky cage attack combo at you if cornered. 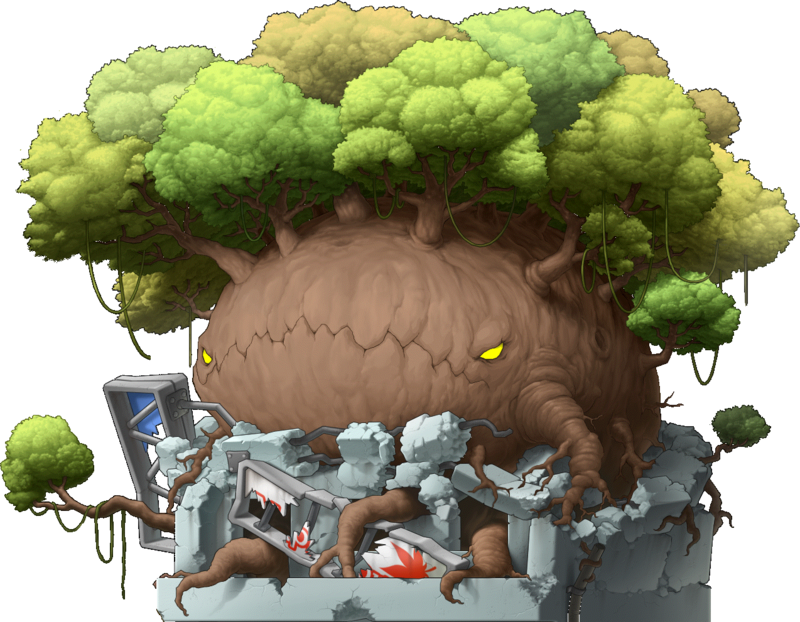 This is one of the most annoying monsters in MapleStory. An assassin found in the Sospetto Forest of Commerci Republic. It can summon 3 Devileyes. A stronger version of Nightpriest Assassin, found in the barrier deep within the Sospetto Forest of Commerci Republic. It can summon 3 stronger Devileyes. A monster from Temple of Time, found at Road to Oblivion 3 and 4. It can attack with its fists, and can slam a spear into the ground, which is indicated by an area warning on the ground. The Star Force version of Oblivion Guardian. Found at Detour to Oblivion 3 and 4 in Temple of Time, an area which requires 90 Star Force to deal full damage. A monster from Temple of Time's past. This is basically a darker version of Chief Oblivion Guardian, even though it is called "Chief Memory Guardian." A mutated Orange Mushroom found in Henesys Ruins. It can stun you and breathe fire at you. A small octopus-like alien. Shoots an energy bolt-like shot from its gun. Located in the Boswell Field maps outside Omega Sector. A mutated Tiru found in Dark Ereve. It can smash its beak into the ground, hurting you, as well as create wind to knock you back a good distance. A concrete golem-like monstrosity. It wanders the deserted streets of Ulu City for unknown reasons. Attacks by swinging its arm at you which causes stone to break on the player. Unlike most golems, this monster has no weaknesses. A squishy black slime creature, similar to the others around Singapore. Summoned by Krexel. It can move relatively fast. A monster based on the Bamboo Warrior near Herb Town. Found at the Creepy Bridge near Mushroom Shrine. A once-powerful boss in Zipangu, now a shadow of its former glory. Attacks by creating a tornado, and by leaping into the air and slamming into the ground. This boss is located at the Vanished Village near Mushroom Shrine. A spider monster that is responsible for corrupting the heart of Colossus. 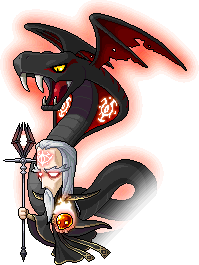 The red insignia on its head hints that it was summoned by Damian, Demon's brother and the Black Mage's recently revealed commander. 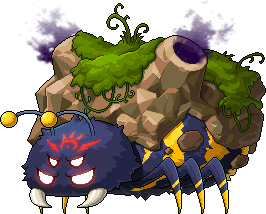 It has several attacks, such as stomping the ground, rushing into you, and using a special web attack with a huge range, which can trap your character in a cocoon, where you must continuously tap left and right before the cocoon covers you and kills you, and finally it can drop something on the ground that will reduce your HP and MP to 1. The boss of the Assassins in Commerci. Il Capo means "The Boss" in Italian. Attacks by swinging its polearm at you, spinning like a twister, and shouting to create a blast. Involved in a quest. The boss of the Assassins in Commerci Republic. Found in the barrier deep within the Sospetto Forest of Commerci Republic. A monster from Temple of Time, found at Road to Oblivion 4 and 5. It can attack with its fists, like the regular Memory Guardian, and it can punch the ground with great force. It can also use an axe to attack. The Star Force version of Chief Oblivion Guardian. Found at Detour to Oblivion 4 in Temple of Time, a map which requires 90 Star Force to deal full damage. A monster from Temple of Time's past. Basically a darker version of Oblivion Monk Trainee, except this one has an angry face. A mutated Slime found in Henesys Ruins. It can raise its weapon attack, as well as create spikes with its body to harm you. A member of the Yakuza in Showa Town. He wields a level 10 Wooden Sword. He attacks like you are fighting another Mapler. A member of the Yakuza in Showa Town. He wields a level 15 Red Brick. A higher-ranking version of Mateon. It does not have any attacks, but it prefers to ram players with its hovercraft-like ship. It is also pretty fast. Located in the Boswell fields of Omega Sector. A mutated Tiguru found in Dark Ereve. It can smash its beak into the ground, hurting you, as well as create wind to knock you back a good distance. A member of the Yakuza in Showa Town. He wields a level 0 Baseball Bat. Another member of the Yakuza that only appears in the Showa mansion. Armed with a knife. An enormous behemoth of a tree that has gained mobility in the destroyed park of Ulu City. It has two attacks, one which it buffs up which can stun you for quite a long time and also shoots a laser at that player. Beware as this monster can also stun lock the player like the Montrecer. A mutated Ribbon Pig found in Henesys Ruins. It can inhale and exhale with great force, as well as punch you 6 times in quick succession, with fairly low damage. A corrupted Night Walker. Found at the Stronghold Entrance, and must be defeated to gain access to the Stronghold. It can use a ranged Lucky Seven. A corrupted Night Walker. Found at Knight District 1 in the Gate to the Future. It can use a ranged Lucky Seven. The Star Force version of Official Knight A. Found at First and Second Drill Hall in the Gate to the Future, an area which requires 120 Star Force to deal full damage. One of the two leaders of the Yakuza, wielding a sword. He swipes his long sword at you for an attack. Acts like any Yakuza member, fighting like an enemy mapler. Located in Showa Town's streets and mansion. Another leader of the Yakuza, found in the streets and mansion of Showa Town. If you attack close to him he'll whack you with his pistol. He can also shoot at you from afar. A criminal imprisoned in the Temple of Time for committing a terrible crime. It should have received a huge punishment for the crime, but was told from birth that its crimes could not be redeemed and was ordered by Goddess Rhinne to be incarcerated on the Road to Oblivion. Rhinne cast the order with the intention of causing the sparks of oblivion to erase Lyka's crimes... 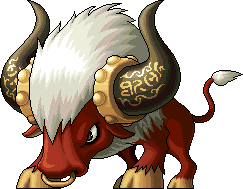 Unfortunately, Lyka's aggression seems to have increased over time, causing all the guards and administrators of the Temple to tremble in fear. It only appears in Road to Oblivion 5. It has an attack where it drops fiery rock shards onto certain spots, indicated by marking on the ground. It can also cast drop a flame on you. As one might expect with all these fire-based attacks, it is strong against fire, but weak to poison. Beware when fighting this alone, as it has the ability to cause the Seduce status effect, but good news is, it only makes you jump to the left. The corrupted version of Lyka, which must be killed for the Silent Crusade. It has the same abilities as the real Lyka. One of the Showa Town bosses. This version of Male Boss is slightly weaker than the other, and found at Showa Street 3. When prompted, he takes out his gun and starts shooting. At the same time, he can summon the Extras and Leaders to help out. Once you enter the highest floor of Showa's Hideout, The Nightmarish Last Days, you can drop the Female Boss's Comb on a shrine to summon Bodyguard A. This Bodyguard possesses a punch which has a 100% stun rate, and if you are punched again and again, you will not be able to recover from it. It also has a kick skill that can knock you back a good distance. Once defeated, Bodyguard B will spawn. The weakest Gray. It possesses psychic powers and can shoot a close ranged pulse that hits any players in its range. Found in Corridor 101 of the UFO near Omega Sector. Appears in the Hallowed Ground of Dawn. It drops the Dawn Stone which is needed to make a Dream Key to enter Cygnus's Garden. Once Bodyguard A is defeated, you will fight this Bodyguard. He can fire a mini bazooka that drops your MP by 5,000. He can also fire off his gun, which can knock you back a good distance. Once defeated, The Boss will spawn. A corrupted Blaze Wizard. Found at Knight District 1. It can use a close ranged Fire Pillar attack which causes the player to be have a pillar on their face and explodes causing damage. The Star Force version of Official Knight B. Found at First and Second Drill Hall in the Gate to the Future, an area which requires 120 Star Force to deal full damage. The lowest ranked ninja found in Zipangu's Ninja Castle. It has a short ranged slash attack. Mysteriously, it changes into a wooden doll upon death. A mid ranked ninja found in Zipangu's Ninja Castle. It can spit poison out of its dart. This version of Blue Mushmom spawns in a Zipangu map called "Deserted House" near Mushroom Shrine, with Red Akamantos, Field Foxes, and Night Foxes. Another one of the Showa Town bosses. She will fire her gun at you, as well as slap you. Also known to as Anego or Ahma (which mean grandma). Found in the Parlor in Showa's Hideout. One of the Showa Town bosses. This version of Male Boss is slightly stronger than the other, and found in the Armory in Showa's Hideout. When prompted, he takes out his gun and starts shooting. At the same time, he can summon the Extras and Leaders to help out. The one in charge of all the Yakuza around Showa Town. It is summoned as soon as Bodyguard B falls. A powerful boss located at the end of Showa Hideout. It has 2 attacks, one of which can 1/1 and seal you, so be sure to bring All Cures and recovery potions when facing this boss. He has a new revamped appearance; the old one in on the right. The fully awakened form of Krexel. It's so massive that it doesn't just fill the map, it IS the map. To fight Krexel, the player will actually have to stand on parts of its body to attack. 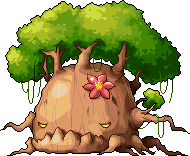 Has a number of dangerous attacks such as lightning coming down which shocks the player, as well as an attack which summons a huge root attack to grow out of the player. It also has the ability to use weapon cancel and magic cancel buffs. Click on this link to view its true size. The final form of Krexel. It's so massive that it doesn't just fill the map, it IS the map. A party fighting Krexel will actually have to stand on parts of its body to attack. After the fight has gone on for some time, Krexel loses an eye, but that only makes the battle that much more fierce. It can summon Bacal and has a number of dangerous attacks. It also gains the ability to use seal on you so be sure to have all cures. Krexel is strong against all elements except Dark. Click on this link to view its true size. The final boss of Leafre's Past. He possesses various skills, such as seduce, potential cancel, damage reflect, and is able to crack the screen, causing 999,999 damage to all players in the vicinity. He can also summon Netherworld Monks, which prove to be a pain without a magician that can kill them fast. He can also can banish you to a dark room, where you must defeat a clone of yourself and exit using the portal on the right. This page was last edited on 17 March 2018, at 17:14.